For many non-solar folks, hybrid solar systems are the dark horse of the solar industry. Unlike off-grid systems, they not only include backup power sources but also connect to the grid which adds a whole other level of complexity and grid compliance requirements. Here, we’ll go into some reasons why a hybrid solar system may be a good choice for you and your company. On Grid or Hybrid PV Systems – What’s the Right Choice? This particular question can be answered in a number of different ways and it really depends on a number of different factors based on your location, budget, and frame of mind. With utility rates regularly rising and the idea of taxing carbon dioxide emissions* more and more people are choosing to invest in hybrid solar energy systems which to some degree limit their carbon footprint and provide them with both stable power and energy savings. In some regions where the utility grids may not be as stable, such as Puerto Rico as reported here by the Washington Post, hybrid solar energy systems are the most ideal solution on the market. Acting as a backup when the grid is down, and also allowing owners to sell excess power back to the grid when excess energy is in abundance. At Symtech Solar, we currently believe that if your grid is stable and your energy costs are low due to low utility rates, you should not adopt the hybrid solution…at least not yet. Many on grid solutions can add the hybrid component as a later upgrade. Only if your utility rates (kWh) are high and or is being cut (brownouts) on a daily or weekly basis should you consider the idea of Hybrid PV Systems. Hybrid is the most expensive solution out of the 3 main system types; on-grid, off-grid and hybrid. What happens to the excess power generated by my hybrid solar system? If you choose to go ahead with a solar hybrid system with battery backup, the excess energy generated during daylight hours can either be stored in the batteries for later use or sold back to the grid. Many hybrid inverters have electronics on board that allow the user to choose how much solar generation goes into the battery and how much goes back to the grid as well as at what time it is sold back. In some circumstances, the utility rates are different depending on the time of day which means that in theory energy can be bought from the grid during low-cost hours and sold back during high-cost hours. The battery system is what makes this possible and is the key component in how much energy is left in the fuel tank. How will I charge the battery system? Another perfectly reasonable question to ask regarding battery storage. There are plenty of non-solar backup power batteries systems (UPS systems) on the market which takes electricity from either the grid or a generator and stores it for later use. 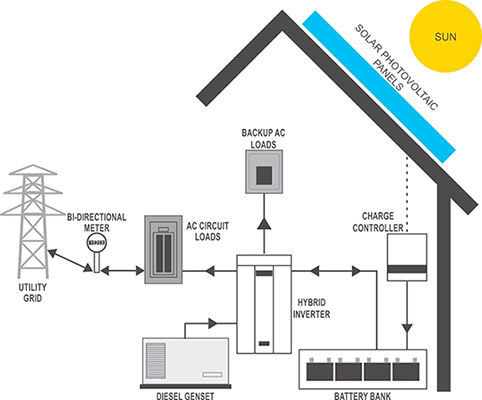 In the case of the hybrid solar PV system, both the grid and the solar array can charge the battery. The hybrid inverter allows the user to choose how much of either one (percentage) will flow into the battery. There are also some hybrid systems that connect to 3 different power sources (see photo above), the grid, the solar array, and a generator. They are each controlled by the hybrid inverter and are utilized based on the user’s settings during commissioning. This is a very important aspect of any Hybrid system. The two must be designed properly from the start to ensure that the performance is what you expect. Put simply, Watts or Kilowatts are both a measure of power while kWh is a measure of Power over time or energy. On-Grid, PV systems are typically designed in kW’s, for example, a 5 kW PV system. If the sun shines on your PV system for 4 hours in a day then simple math says 5 kW PV system x 4 hours = 20 kWh’s. Keep in mind this is a very simplified explanation and does not include system losses or irradiation values. The point is that when we add batteries to a system we begin to think more in kWh’s which is the amount of storage within the battery. For example, if you have a 5 kW Hybrid PV system (5 kW PV array) and a 5 kWh battery bank then in 1 hour of daylight you can charge the battery bank from 0% to 100%. This battery can now discharge 5 kWh’s of energy to any load including the grid (for this example we are not considering the depth of discharge). If you have a battery that has 10 kWh’s of storage it would take that same 5 kW PV system 2 hours to charge it….however, when the energy is brought back through the hybrid inverter you can not get any more “POWER” then 5 kW at any given time. The maximum output for this system would be 5 kW’s for 2 hours or 10 kWh’s. The key here is to understand how much PV (in kW’s) and how much Battery (in kWh’s) is needed to support your needs. Out of the 3 main categories of PV systems Hybrid is typically the most expensive. The next is Off grid followed by the cheapest solar energy solution which is On Grid. There are some components which are identical in all systems so it’s important to only look at the differences to see the cost difference. What components are the SAME across all 3 system types? All 3 system types could have the exact same PV modules, mounting system, and PV wiring (wiring depending on the inverter input voltage requirements), array grounding, and wire management components. What components are DIFFERENT across all 3 system types? This is where the real price differences come out in full force. First off is the obvious difference which is batteries which are included in the off-grid and hybrid solutions. Without going into too much detail there is also a variety of different battery classes that can be used in both systems. Below is a chart of the typical types of batteries found in these types of systems. Another major difference in the 3 types of systems is in the inverter. As all 3 may look very similar on the outside, on the inside they are very different. On-grid inverters are typically the most simplistic are usually the cheapest per Watt or kW followed by Off Grid inverters then most expensive is the Hybrid inverter. The main reason that the hybrid inverter is the most expensive is that it has the highest level of components inside which allow it to function in an on-grid and or off-grid mode at any given time. Besides the major components that off-grid and hybrid systems have there are also subcomponents that add cost to the systems. This would include a battery rack or storage cabinet, battery wiring, and safety disconnects. In Summary, Hybrid PV systems are usually the most complicated and expensive systems on the market, however making them simplified is what we specialize in. Symtech Solar has energy storage calculation sheets and a staff of engineers that can walk you through the energy audit process to get the correct system designed for your specific requirements. The last thing you want is an over-sized and expensive system that is underutilized or a cheaper system that is not big enough for the demand you require. Remember when you look at the price there are many factors involved so make sure you take the time to measure apples to apples.